Coastal Gallery Lymington has introduced a small range of art-inspired clothing . Bev and Stewart are always on the look-out for eye-catching new additions to the Gallery’s collections, so watch this space! wonderfully vibrant colours seen on Kate and Rob’s recent travel adventures. Prices range from £75 to £125 and different sizes are available to order – you won’t find the collection anywhere else. Miss Kiki Salon, established by leading UK brand consultant, Kate Burton and textile designer Rob Burton, is a unique fusion of art, fashion and all aspects of design. Bev and Stewart asked Kate and Rob to design an exclusive collection of clothing that would complement Coastal Gallery’s eclectic and colourful selection of contemporary abstract art, photography, sculpture, ceramics and jewellery. The result is All our Holidays, a bright and painterly collection of summer dresses and tops, each one hand-printed by Rob and created by Kate. Each design is available to order in a variety of sizes, and prices range from £75 to £125. 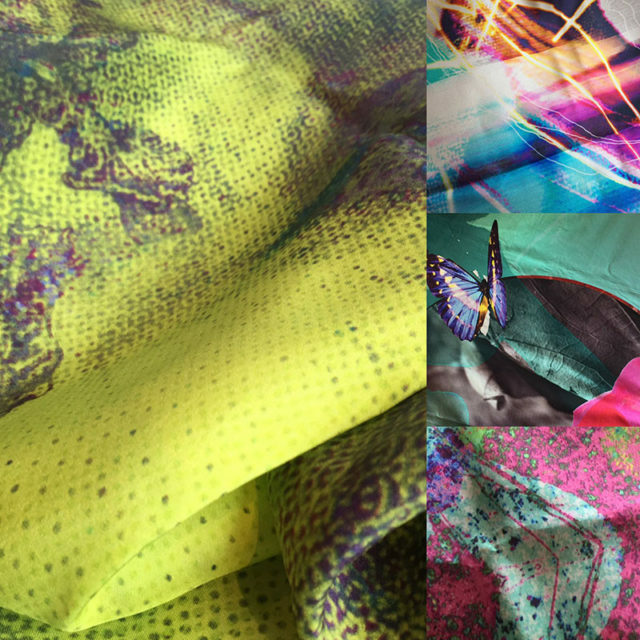 Coastal Gallery also stocks a small range of Rob’s exclusive scarves in stunning silks and crepe de chines. Bev and Stewart are looking forward to collaborating further with Miss Kiki Salon on all sorts of exciting design ideas so watch this space! Please contact us for further details.